Magical Urban Fantasy Reads: Authors Are Rockstars Tour: It’s a Wrap! 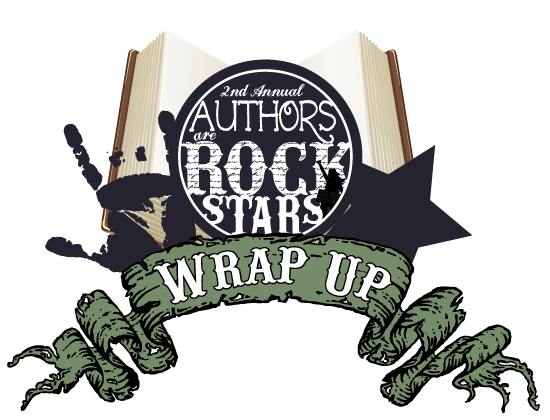 Authors Are Rockstars Tour: It’s a Wrap! August has ended and so has the 2nd Annual Authors Are Rockstars Tour. This year’s event, with over 160 authors on tour, was a bit more of a challenge, but still a lot of fun. There were guest posts, interviews, dueling interviews in which two authors interviewed each other, playlists, top ten lists, deleted scenes, excerpts, a chat and much, much more. This year’s author participants sent along some amazing posts for their blog hosts, proving our point that authors are in fact rockstars. And the bloggers that hosted their favorite rockstar authors did a phenomenal job of showing those who stopped by exactly why their author was a rockstar. In the end we had 168 participating authors plus one author spotlight and 155 bloggers involved in this event. Which was totally surprising and absolutely amazing. Even with a few mishaps along the way we definitely consider this event a success. If August was as crazy a month for you as it was for us and you didn't get a chance to visit all the stops, CLICK HERE for the full lineup with direct links to each of the stops on tour. There may even be a few giveaways still open, so be sure to check them out. For this year's event we were honored to welcome back a number of authors from last year and were thrilled to welcome a number of new authors to the tour. Some of the author participants have long been on our rockstar authors list but we are totally stoked to be able to call many new or new-to-us authors rockstars this year. We hope, for both readers and author and blogger participants alike, that this event was a lot of fun. And we hope that with this year's tour we were able to put a few new authors and bloggers on your radar. The authors on tour this year are all ones we consider rockstars, but they are not all the authors we consider rockstars. While we would have loved to include every single rockstar author on our tour, we are only three bloggers and can only do so much. But we were super excited to be able to add to the number of authors we had on tour last year. We will each be announcing the winners of our tour "kick-off" giveaways on our respective blogs next weekend. So be sure to stop by to see if you won. Winners will also be contacted by email after the announcements have gone live. Firstly we cannot thank the authors enough for generously giving of their time to this event. Taking the time away from their busy writing and editing schedules to create the posts and answer the questions and to support this event means the world to us. Without them there would be no event. And we are eternally grateful. Once again we have to thank the wonderful team at Harlequin TEEN for their unfailing support of each and every one of their authors by offering their books for giveaway and for helping to spread the word about this event. And, of course, we have to thank the wonderful blog hosts who wrote such heartfelt passages about why their author was a rockstar, who came up with interesting topics and questions for the authors they adore, and who put together some pretty fantastic posts which gave readers the chance to learn a bit more about each of the participating authors on tour. We'd also like to give a special thanks to Lost at Midnight Reviews for putting together an amazing post spotlighting her rockstar author when circumstances prevented her from being able to participate. If we hadn't already considered her author a rockstar, we most certainly would have after reading her post. And last, but absolutely not least, we would like to thank all of the readers who followed the tour, left comments sharing their thoughts about the rockstar authors on each of the blog stops, who helped to spread the word about this year's event, and who share their enthusiasm and love for the authors year after year by reading their books and spreading the word to anyone who will listen. Every single one of you totally rocks! This year's event couldn't be the success it was without both Jaime of Two Chicks on Books and Rachel of Fiktshun co-hosting with me. There is no way we could have pulled off an event as large as this year's event without being able to work together as a team. And I felt like together we were an awesome team. I want to once again personally thank Jaime and Rachel for letting me participate in AARS this year! And I want to especially thank them for being patient with me when I went completely off the grid on vacation during a very critical time for AARS, right before the event started, and also when I was completely MIA because I caught a strange virus that had me in bed almost comatose for a week! You ladies totally rock! And thanks for understanding!!! I hope I pulled my weight when I wasn't MIA! These ladies are amazing and, in my opinion, Jaime and Rachel are super heroes and they’d totally take down superman in a fight! And you all have to know that if it weren't for Jaime and Rachel’s awesomely amazing tracking/scheduling system running in the background and if it weren't for both of them being extremely organized, this would have been a crazy mess. I’m thoroughly impressed! I couldn’t be more thrilled that I got a chance to help them and participate in such an amazing event. If we've forgotten to thank anyone, we are so, so sorry. While the event has ended, we are still knee-deep in giveaways, so we are still just a bit frazzled. So... just in case someone was missed, we'd like to thank everyone! The Authors Are Rockstars Giveaway Winners will be posted next weekend, so be sure to stop by each of our blogs to see if you've won. But for now... it’s a wrap. Great event! Really enjoyed it both years and hope you guys do it again next year. Thanks for doing this with us Mindy! We definitely couldn't have done it without your help <33333 you!